Yarosz, born in Pittsburgh in 1910, was the second of eight children. After his father died Teddy quit high school to go to work to support the family. After a great amateur career Teddy turned professional in 1929, fighting first as a welterweight and later as a middleweight. Yarosz reached the pinnacle of his great career when he won the World Middleweight Championship in 1934 with a decision over Vince Dundee. His tenure as champion of the 160-pound division ended abruptly a year later when he suffered a torn cartilage in his knee. Moving up to fight as a light-heavyweight he recorded some of his most impressive victories. He finished his 13-year career (1929-42) with a record of 106-18-3 and was inducted into the World Boxing Hall of Fame in 1998. After a great amateur career Teddy turned professional in 1929, fighting first as a welterweight and later as a middleweight. 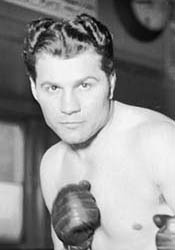 Teddy quickly rose up the ranks, going undefeated in his first 61 bouts, Promoted as “the Polish Panther,” he was a big attraction in cities with large Polish populations, like Detroit and Cleveland. Money was hard to come by during the Depression, and Teddy had to fight often, He had 10 bouts in 1934; 13 the year before. However, with the Middleweight crown in his possession, it looked like he would have some big paydays in his future. On January 1, 1935, Yarosz decided to make some extra money by taking on Eddie “Babe” Risko (real name: Henry Pylkowski) in a non-title bout in Scranton, Pennsylvania. Yarosz lost the fight as he suffered a fractured kneecap, along with torn ligaments and cartilage. Surgery kept him out of action for several months, and when he returned to the ring his knee was still bothering him. He offered a title defense to Risko in late 1935, and his leg went out again. Risko won the decision and the title. The injury seemed to have ended Yarosz’s boxing career, but after several surgeries and intensive, painful rehab, he mounted an impressive comeback. A fighter who had relied on speed and movement, the injury forced him to use more cunning and guile. His wins included one over Risko, who had since lost the title. Yarosz worked hard to get another title shot; one of the few times he took time off from training was to take his mother to a return trip to Poland in 1937. Yarosz moved into the light-heavyweight division and had a series of memorable in-town fights with fellow Pittsburgh native Billy Conn that drew large factions of Polish and Irish fight fans. He lost two controversial decisions to Conn before scoring an impressive win in 1938. Unlike some other top white fighters who avoided top black fighters, Yarosz took on all comers. One of his most memorable wins was a 1939 decision over Archie Moore, who would later hold the light heavyweight title for 11 years. Another notable event took place in 1940, Yarosz was on a card that included the pro debut of younger brother Tommy, who went on to a long and successful career as a light heavyweight. By the early 1940s Teddy realized he would not get a title fight, and he fought his final bout in 1942. Teddy returned home to Monaca with his wife, the former Eugenia Lesniak, to work and raise a family. He was the first athlete honored with a Polish Falcons lifetime membership. He died in 1974 at age 63, and was inducted into World Boxing Hall of Fame in 1998. Over his career he had a record of 106-18-3, ranked in the top 10 in his weight class for 10 years, and fought 11 world champions — defeating 10 of them. He was arguably the world’s best middleweight boxer of the 1930s. He did it all while maintaining a reputation as an honorable man of impeccable character, bringing great pride to the Polish American community.